I call this recipe Ryan Nelson’s favorite dinner. Ryan is my brother-in-law and he LOVES cream of mushroom soup. Specifically Campbell’s brand. He eats it by the spoonful. My husband and I always laugh at him because he loves canned cream of mushroom soup but he doesn’t like mushrooms. I mentioned in my weekly newsletter that we had a family reunion last week. I was with Ryan and he was telling me about his “favorite dinner” which he proceeds to tell me is some pork (can be pork chops, pork roast, pork country style ribs) with some salt and pepper and then cream of mushroom soup on top. He cooks it in the slow cooker for about 6-8 hours. I laughed that his favorite dinner could be something so easy to make. I bet it makes his wife happy when he requests his favorite dinner. 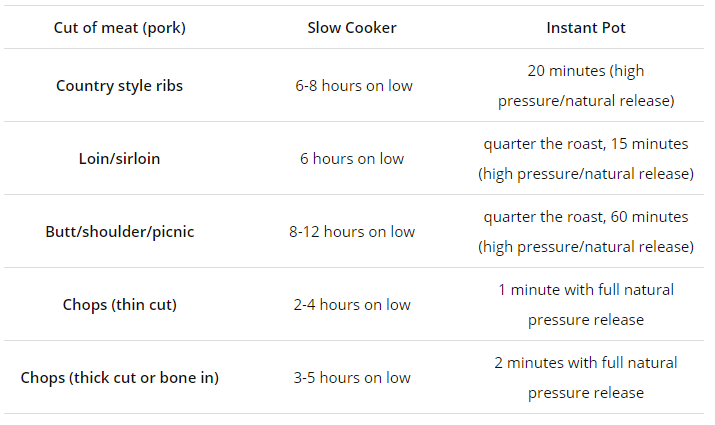 If you’re like Ryan and are a huge fan of cream of mushroom soup then you should try his “recipe.” Here’s a chart to help you know how to cook each cut of pork. What Appliance Did You Use? 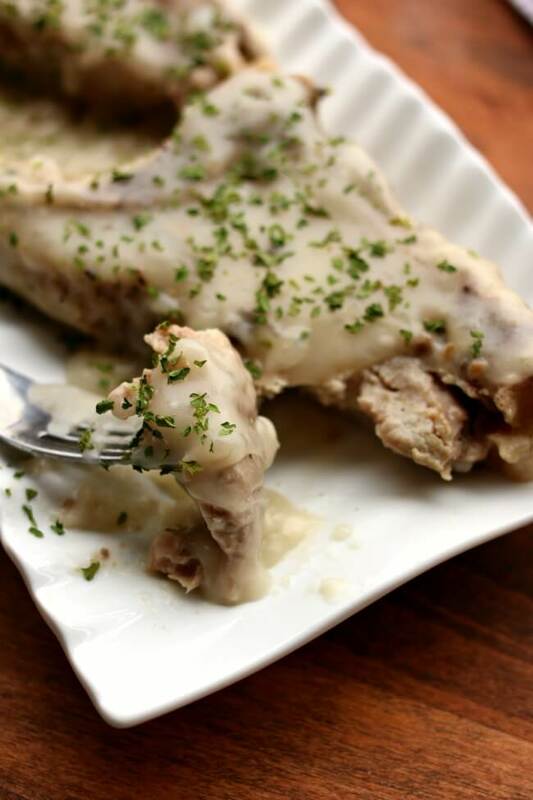 To make slow cooker Creamy Mushroom Sauce Pork I used my 6 quart oval Kitchenaid slow cooker. * I love this slow cooker (you can see me talking about it in a video here). It cooks low and evenly. I love the medium heat choice because most slow cookers that I’ve seen only have the option of cooking on low or high. If you’re going to buy just one slow cooker, this is the one that I recommend. 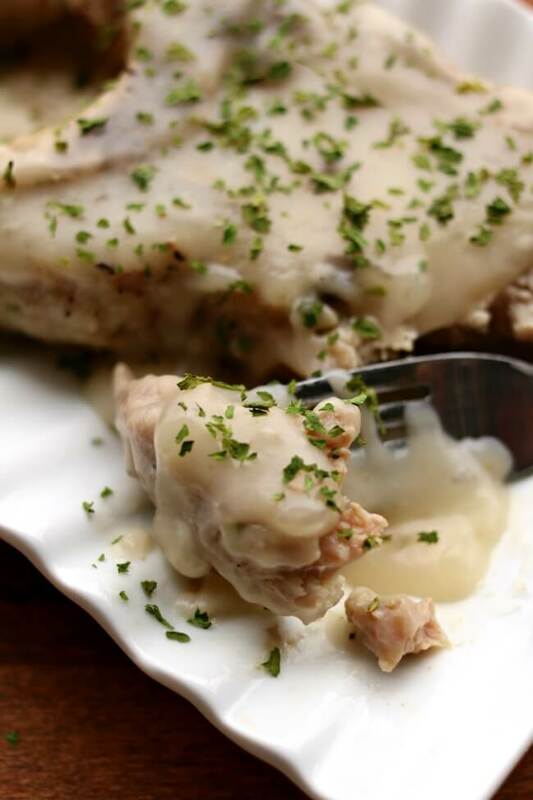 To make Instant Pot Creamy Mushroom Sauce Pork I used my 6 quart Instant Pot Duo 60 7 in 1*. I love this Instant Pot because it has the yogurt making function which I use almost weekly. It has two pressure settings (high and low), and there are also little slots in the handles so that you can rest the lid there instead of putting it down on your counter-top. The easiest recipe ever. With only 2 ingredients the prep for this pork dinner is minimal. Plus you make it in the slow cooker or Instant Pot so it’s completely a hands-off recipe. If using the Instant Pot, pour 3/4 cup of water (or chicken broth) into the pot. Place pork in the pot and lightly salt and pepper it. Dump cream of mushroom soup on top of the pork. If using the slow cooker, no water is necessary. Cover and secure the lid. Use cooking times as noted in the chart below. To thicken the sauce, make a cornstarch slurry by combining 1-2 Tbsp of cornstarch with 1-2 Tbsp of cold water and stirring until smooth. Stir the slurry into the Instant Pot or slow cooker and cook on saute mode or high until the sauce has thickened. Serve pork as is or shred up and serve with the sauce. This recipe can be gluten free. Substitute a container of GF mushroom soup for the can of cream of mushroom soup . Pacific brand makes it and it’s in small cardboard-like containers. About the same time as the loin. Maybe add 2 minutes. How long for boneless country ribs? I can’t say for sure but go with the times listed above for country ribs. How long to cook the potatoes in the IP if not cooking ribs or loin? 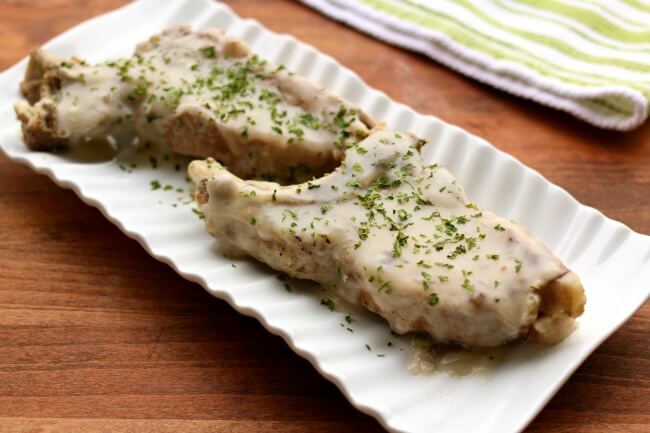 I have boneless 2.5″ loin chops and would enjoy cooking the potatoes at the same time. Thanks! Are you trying to make baked potatoes? Baked potatoes would take a lot longer than the chops. However if you cup of the potatoes into cubes that would probably work. 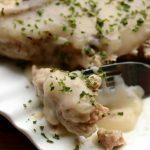 My mother always made porkchops with the cream of mushroom soup, but she also added yellow mustard underneath the cream of mushroom soup, cooked in the oven. It really added an extra zing! I wonder, have you ever heard of this version? I’m new to the electric pressure cooker and I find your recipes and explainations very very helpful! Thank you!! Yum! I will definitely have to try that. I really like mustard. Sounds delicious but I’m wondering if I can make potatoes at the same time? I would love some baked! Wrap them up in foil and throw them in with the pork in the Instant Pot. If you choose the country style ribs or pork loin, the potatoes should cook at the same rate. Your comment that your brother-in law likes mushroom soup but not mushrooms sounds like me. I like raw apples but not cooked, not applesauce, apple juice — nothing cooked. By the way, I love your recipes. Haha!! It’s funny how we are isn’t it?